One of the star commodity performers over the past year or so has been cobalt. With the metal’s price rallying sharply, it is paying off for companies — and investors — that have caught wind of its popularity. Cobalt is a specialty metal vital in the production of rechargeable batteries – its properties allow it to store power for longer. As such we are seeing increasingly widespread use in the manufacture of smartphones and lithium-ion batteries used to power electric vehicles. With 42% of cobalt demand coming from the battery market, demand is unlikely to subside anytime soon, especially as traditional car manufacturers follow Tesla’s lead and move into production of electric and hybrid vehicles. In light of the lithium-ion battery and associated electric vehicle explosion, it’s been no surprise that cobalt has rallied. And if we combine this skyrocketing demand with current supply and production issues, due to an underinvestment in the metals’ production and a lack discoveries outside of the Democratic Republic of Congo where most of the global supply has come from, we start to get an understanding of why cobalt’s price is more than double what it was just a year ago. While still an early play, the tenements of today’s ASX cobalt explorer have all the geological similarities of DRC, but being located in the Yerrida Basin in Western Australia, there are none of the problematic political risks or human rights concerns. The company’s flagship project is the Tabac Cobalt Gold Project, where drilling is commencing any day now. 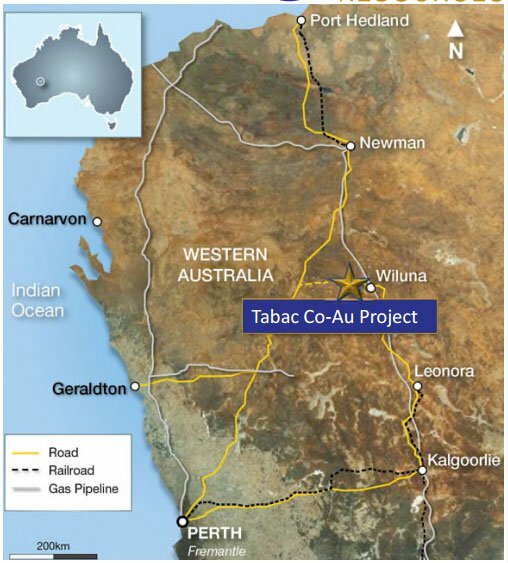 The Tabac Project already has promising early results, and following the company’s recent capital raise, the company has $3.6 million in the bank and is well-funded to conduct drilling. With a revised focus on cobalt exploration, this ASX stock is highly leveraged to the cobalt price, and while the market is positively re-rating junior exploration companies in the sector, the timing looks to be right here. However, the company is in its early stages and investors considering this stock for their portfolio should seek professional financial advice for further information. 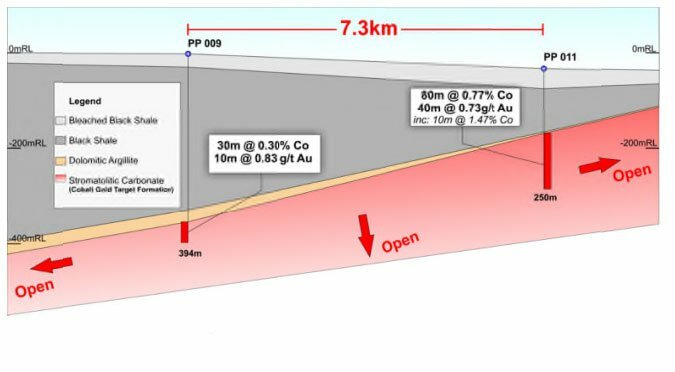 If the Yerrida Basin’s geology and historical drill results are anything to go by, the Tabac Cobalt-Gold Project could potentially be unmatched in terms of both scale and grade in Australia. This is one of the few pure cobalt plays being pursued in Australia, so as its maiden drilling program gets underway expect plenty of significant newsflow to follow. Riva Resources (ASX:RIR) is a Perth-based exploration company operating in the Wiluna region of Western Australia. Currently capped at $16.8 million, its flagship project could have both the scale and grade to help meet the anticipated growing global demand for cobalt, and investors will be no doubt watching this imminent drill campaign closely. 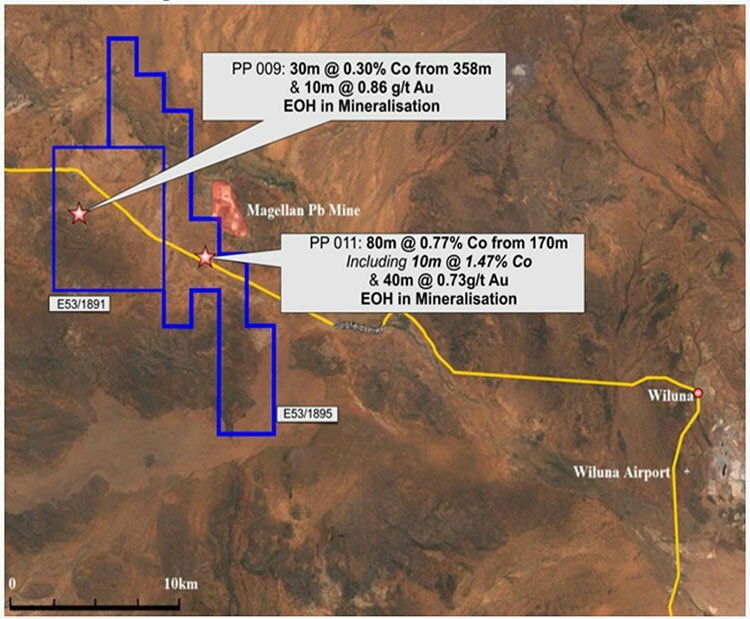 Located on the Goldfields Highway — 30 kilometres west of Wiluna in in the Northern Goldfields Region of Western Australia — RIR’s flagship Tabac Cobalt Gold Project is a significant cobalt-gold exploration target. Back in January, RIR was granted one of two key exploration licenses (53/1891) at the Tabac Project. The license covers just under 50km 2 and contains a significant historical drill intercept. Its second exploration licence (53/1895) was granted in March taking the combined exploration area to around 110km 2 . The second licence also contains a second significant historical drill intercept, giving RIR further grounds for enthusiasm. To fund this drilling program RIR undertook a capital raising earlier this year, in which it raised $2.2 million in a heavily oversubscribed book build to sophisticated and institutional investors. The funds raised will allow RIR to accelerate and expand the planned exploration program at its Tabac Cobalt Gold Project as well as go towards the upcoming drilling campaign on the adjoining Rosslyn Hill Mining tenements. Despite ‘apparent’ contamination cited by a previous explorer in the Yerrida Basin, RIR has challenged this view and is looking to replicate previous positive results, whilst also looking to expand its footprint via a likely Joint Venture on Rosslyn Hill Mining’s adjacent ground. RIR already has an excellent relationship with Rosslyn Hill, (Rosslyn Hill Mining, formerly known as Magellan, is owned by the $38 million capped TSX company LeadFX) having signed an important Memorandum of Understanding which not only expands this cobalt explorer’s footprint from 111.5km 2 to 157km 2 , but also gives it access to key infrastructure and services. Results from historical drilling conducted in the 1980s by ACM Ltd, highlight the existence of cobalt. At the time, ACM weren’t explicitly looking for cobalt, but in any case they came across significant intercepts. Between 1982 and 1984 ten historic diamond holes were drilled. 80 metres at 0.77% cobalt from 170 metres, including 10 metres at 1.47%. 30 metres at 0.3% cobalt from 358 metres, including 10 metres at 0.86 g/t gold. Did we mention the historical results were significant? In fact, they were so significant that they provided RIR a highly compelling reason to conduct follow up drilling and focus the bulk of its attention on its cobalt ambitions. While the average grade is 0.19%, the largest projects in the DRC average around 0.50% cobalt. Compare these numbers to the historical drill results at the Tabac Project of 80 metres at 0.77% cobalt, and 30 metres at 0.30% cobalt. It’s early days of course, but if RIR can continue to prove up cobalt grades like this, it could be the first signs of an emerging new cobalt project in the geopolitically stable Western Australia. RIR also reviewed new XRF geochemistry data from 2008-2010 to define widespread cobalt anomalism at the project. The work was undertaken by two companies between 2008 and 2010 aimed at exploring for extensions to the Paroo Station lead mine which is located adjacent to the Tabac Project. Of the 5,750 XRF readings taken, 249 samples reported values exceeding 500ppm cobalt with 28 exceeding 1,000ppm or 0.1% cobalt. This data along with geological modelling will be used to refine exploration targeting for the upcoming drill program. RIR has entered into an exploration memorandum of understanding in relation to an exploration farm-in and joint venture with Rosslyn Hill Mining — a wholly owned subsidiary of Toronto-listed LeadFX Inc — and owner of the Paroo Station lead mine. The agreement relates to Rosslyn Hill’s 46km 2 tenement package and infrastructure at Paroo Station, which is situated immediately east and south of the Tabac Cobalt Gold Project. This will expand RIR’s footprint to over 157km 2 within the Yerrida Basin and encompasses a number of prospective, regional-scale geological structures and geochemical anomalies. RIR may earn 75% of the cobalt, gold and copper mineral rights on Paroo’s tenements through exploration expenditure totalling $6 million over four years. Once RIR reaches 75% of the mineral rights it will enter into a formal joint venture. There has been speculation from past owners that inconsistencies between the primary and limited secondary check assays and the high grades of cobalt reported at Tabac in the 1980s could have been contaminated. An analyst recently dismissed RIR’s confidence in the historical cobalt intercepts and instead focused on the theory that the highly promising results were contaminated by cobalt derived from wear on the saw blade used to cut the drill core. This brought into question the likelihood of cobalt mineralisation at the project. It isn’t really surprising that such high grade historical results — discovered when ACM weren’t even drilling for cobalt — has brought their accuracy into question. Yet, RIR essentially quashed that argument when its experts argued the drill blade is much denser than the ground being drilled so that any contaminated from the blade was highly unlikely. RIR followed up on March 9, with an update explaining that there was an inconsistency in those historical results between the primary and limited secondary check assays. What is the origin of the gold and silver results in the primary assay as neither metal form part of the saw blade composition? Is it plausible to expect a saw designed for cutting structural steel to degrade whilst cutting substantially softer materials, i.e. limestone? Is it conceivable for a blade to degrade so significantly as to enrich cobalt to economic levels over an 80m and 30m interval in the respective drillholes, PP011 and PP009? Thus, Riva finds sufficient doubt over the quality of the quality assurance work undertaken by ACM exists to justify redrilling of the two historical intercepts. The company is confident in the presence of cobalt, and cites other drill and surface geochemistry results from around the Yerrida Basin performed by other companies in the 30 years of subsequent exploration as proof. But truly the only way we are going to find out the extent of cobalt in the ground, is via this upcoming drill campaign. While the debate on past results didn’t bode well in the short term, it has opened up opportunities for new investors to pick up the stock at a discount to where it was priced just a few weeks ago in late February, ahead of the imminent drilling. While overall, it’s up by more than 200% in that time, it has come under pressure since hitting a high of around $0.04 in late February this year. It peaked following news of the successful completion of its capital raising and on the report of multiple high grade cobalt results reported by previous explorers — both on February 24. It then dropped by almost 50% to its current price of around $0.021, but with drilling due to begin any day now, following up on highly promising historical drilling demonstrating its scale and grade potential, a timely re-rate isn’t out of the question. At the same time of course, success is no absolute guarantee – so investors should invest with caution – this is a speculative stock. A work program has been approved on the new license aimed at drilling a twin hole on E53/1891 (PP01) and Rosslyn Hill’s ground. If results from the drilling that is currently being conducted, returns results similar to what RIR is expecting and the presence of cobalt is confirmed, the current low share price and market cap may not last. The DRC currently leads the world in cobalt production, with around 60% of all cobalt output worldwide. However, there are compelling reasons why this should change and it helps explain some of the supply issues we are seeing. 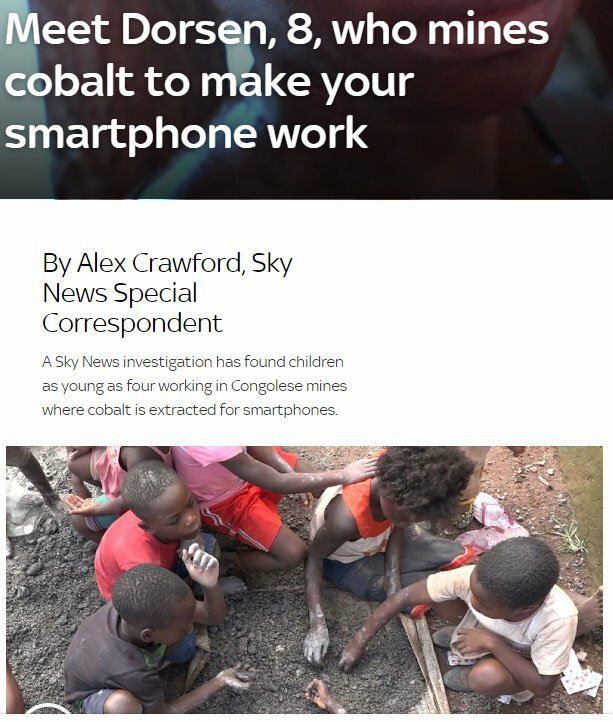 As you can see by the article above and the one just a few paragraphs below, cobalt mines in the DRC are plagued with human rights violations, including forced and child labour, and dangerous and harsh working conditions. It’s not uncommon for children as young as four to be working these mines, where workers use hand tools to dig hundreds of feet underground with little oversight and few safety measures. That brings two problems for manufacturing companies that need cobalt to make their products. The first is that production can suffer from operational disruptions associated with operating in a politically unstable location such as this, and secondly, these companies — under added pressure from their shareholders and human rights groups — are becoming more sensitive to the ethical issues that are coming under increasing scrutiny. This means there is pressure on companies like Volkswagen, Samsung and Microsoft to identify and then source cobalt from more ethical and stable mining jurisdictions. Already, in what could be the beginning of a wider trend among manufacturers, Apple will no longer use suppliers that source cobalt — used in the manufacture of its iPhones and iPad batteries — from the DRC. What RIR could potentially have on the table is cobalt mineralisation that is comparable to that found in the DRC. All without the political and social risks that can be avoided by operating in Australia rather than the uncertain African nation. 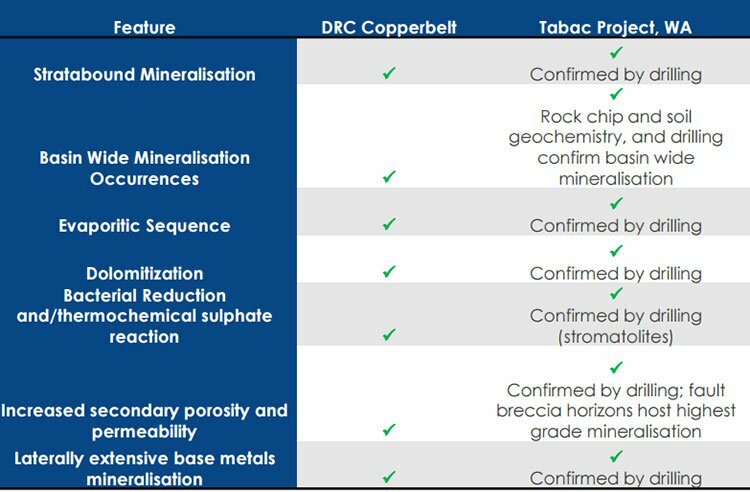 As you can see, RIR’s Tabac Project ticks all the same boxes and as the world looks to alternative sources of cobalt, and whilst it’s an early stage play, RIR could be well positioned to meet future demand. There’s certainly growing interest in the future for cobalt — particularly around Australia’s potential to meet the rising demand for supply. 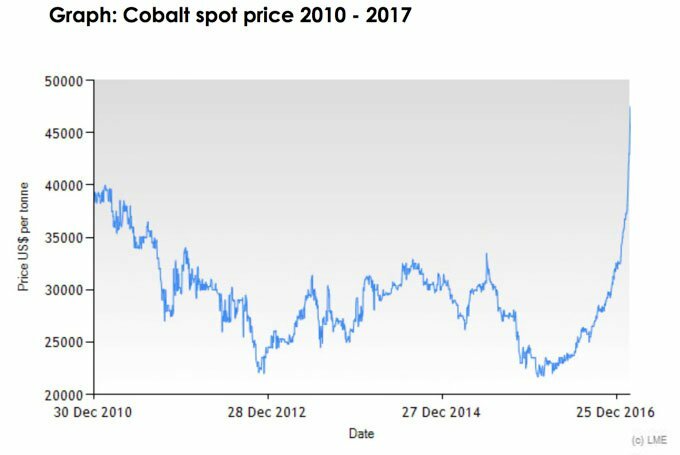 As you can see below, over the past year or so cobalt prices have seen a sharp resurgence. This has come about due to a supply crunch coupled with underinvestment in the metal – a vital ingredient in lithium-ion batteries. However, it should be noted here that commodity prices do fluctuate and caution should be applied to any investment decision and not be based on spot prices alone. Seek professional financial advice before choosing to invest. Market sentiment and opportunities presented have seen RIR’s focus overwhelmingly fixated on its cobalt potential. However, that’s not all that RIR has going for it. RIR has an almost equally large gold story. Testing of its gold potential has revealed significant width and volumes of gold at its Tabac Project, and the upcoming drilling may shed some further light on RIR’s gold ambitions. While still in exploration stage, RIR has significant potential as it progresses towards its eventual goal of cobalt production. Drilling is just days away and results will follow not long after, which could determine whether high grade cobalt mineralisation is present, as was suspected from historical drilling. If similar results can be repeated and establish the potential existence of a large cobalt gold system at the project, it could one day be a globally significant source of production. The cobalt market is seeing rising demand from manufacturers as the battery storage revolution charges on and if RIR’s suspicions are correct it has real potential to bring much needed supply to the market. Combine this with a beaten down current share price and the lack of cobalt-focused investments on offer in Australia, and it might be well worth a much closer look at RIR. The best part is, in the very near term we can expect increased news flow as highly anticipated drilling results are announced.